Kim has been teaching gymnastics now for over 20 years. Her career began in New South Wales as a part time coach in between her own training hours in Artistic Gymnastics. Once Kim finished high school she began coaching full time Women’s Gymnastics. 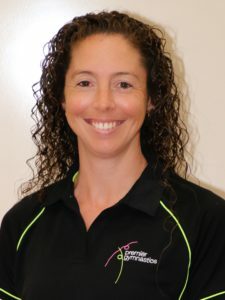 Kim now hold’s the following accreditation’s and qualifications, Kinder Gym Coaching Accreditation, Intermediate WAG Coaches Accreditation, Cheerleading Coach (ongoing), Acrobatics Coach (ongoing) and is currently studying her Bachelor of Education/Primary. Kim is also a State Gymnastics Course Presenter. Although Kim has coached many levels of gymnastics throughout her career, her passion lies in coaching our 0-5 year olds and Junior Development Squads. Kim says it is at this ground level that she is able to engage with a child’s love of movement and scaffold their strength, flexibility, co-ordination, emotional and social skills to prepare them for whatever it is that they pursue later in life. Kim absolutely loves gymnastics as she believes it is a sport that develops the whole child not just physically but socially and emotionally as well.